I must admit there are tears in my eyes. I love these characters so much that even on a 5th read through I ache for them. As I’ve said many times before it is an earned cry. It is a cry because I care. The whole theme of The Book Thief is encompassed when Death says the human race can be “so ugly and so glorious,”. That is this book and what a book! 1. How did you feel when Max had to leave the Hubermanns? What did you expect would happen to him? Nervous. For sure he was done for and nervous for all involved. I kept waiting for Liesel to see him in the marches or that Death would tell me another prediction. When she finally see’s him it is one of the most brutal and sweet scenes of the whole book. 5th time and still made me cry. 2. Why do you think Liesel ran out to Max when they finally did cross paths, even after she had seen what happened to Hans earlier in the book? True love. Real friendship. Love overcoming hate. Its a perfect moment of so many emotions and yet how could she have not? There is a limit to how far any human being can be pushed. 3. What did you think of Death spoiling the ending a couple chapters before it actually happened? Did the warning make it easier to handle? Ugh. Its so sad. I cry just thinking about it. It reminded me of a eulogy at the beginning of a funeral. Its kind of a summary of the life and then the rest of the service is the meat, the details, the stuff that really matters to creating a meaningful life. 4. Which death impacted you the most? Ugh. How do you pick. Liesel grabbing Hans accordion and weeping over Rosa’s body. Her kissing Rudy. My heart breaks. I guess Rudy but even smaller characters like the Holtzapfels or Randolph the mysterious soldier are so tragic. That’s how rich this book is. You feel deeply for a barely mentioned character. Its all mankind that’s death impacts me the most. 5. How did your view of Ilsa Herman change over the course of the book? 6. The power of words is such a big theme throughout the book. Which instances of powerful words stuck out to you? Or, which quotes from the book stuck out to you? I already shared some. A theme of the book is that we are all book thieves. We all take the words of an author and make them our own. Make them part of our lives. That is what the word shaker teaches us that throwing words are the only thing that defeats evil. It also creates evil which is the scary part of the book and why only death could be the narrator. In many ways I felt that the book is about Liesel’s different kind of loves – for Hans, for Rosa, for Rudy and Max, and for books and living in general. Which of those loves resonated with you most? I think friendship did. I guess this is the love that I have the most of in my life. Friendship has saved me time and again. It is the only love in our lives that is chosen aside from maybe marriage which is perhaps the greatest friendship. To be someone’s friend is not required or expected where to support a spouse is. To be a friend takes the ultimate love. You see this time and again in the story. Rudy and Liesel. Liesel and Hans. Hans and Rosa. Liesel and Max, Rosa and Liesel. Ilsa and Liesel. Max and Hans. etc. To be a friend is the greatest gift we can give someone and that trust is priceless. 8. Thoughts on Liesel and Death finally meeting? It felt kind of like God and mankind meeting. Like a judgement day where someone is admitted into heaven. 9. 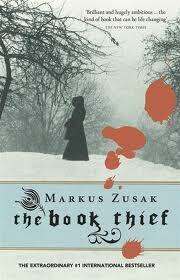 If this was your first time reading The Book Thief, is it what you expected? If it was a reread, what did you notice this time around? 10. Will you see the movie? Yes. I’m skeptical but was very pleased with the trailer. I look forward to seeing it. Should we get a group of Utahans and all go? So the readalong of the Book Thief continues and these are the discussion questions for this section with my answers. Also there is going to be a twitter discussion tonight at 7 pm Mountain time! Hashtag #bookthief. They are both fighters. They both rely on Hans. They are both drawn to books as a survival tactic. They are both hiding and outcasts. They both have nightmares. When I first read the book The Standover Man seemed very adult for a child but let’s be honest Liesel is not able to be a child from the beginning of the story except maybe with Rudy. Its interesting because Max says ‘all my life I’ve been scared of men standing over me’ and then he must hide and he finds the best ‘standover man I’ve ever known is not a man at all’. Does this mean there is a part of Liesel that scares Max? Perhaps the love he feels for her scares him and the knowledge that he could be found and she could be hurt by his presence in the house scares him? It kind of reminds me of the witches in Macbeth. They foreshadow what is going to happen but it just makes the how of the story all the more engrossing. He is living in an era where right is wrong and wrong is right. I like when he tells Liesel that he ‘needs a win’. I think that is why he is rebellious. He wants something to make sense. Plus, he’s starving. When he is beaten Franz Deutscher for not reciting Hitler’s birthday it shows how everyone had become a bully and you could either play along or get slaughtered. Yes, there are a couple great scenes that add layers to Rosa’s character. When she is cutting Max’s hair she says ‘I’ll probably make a lot of mistakes on him’. I think Rosa’s anger comes out of a fear that she will make a mistake with Max, someone will find him and they will all suffer. If Rosa really was the beast she seems at first she wouldn’t have had this moment of sadness for Liesel. I wonder what frustrated her the most? It certainly was more than the loss of a client. It kind of reminds me of some of my mission companions. We were put together and then found our common interests not the other way around. They are like brother and sister or even father, daughter at times. I think Liesel is angry at Ilsa for grieving. She has so much that others don’t have and yet she grieves. To a child this doesn’t make sense and seems very selfish. Its interesting that her brother is ‘next to her’ when she is yelling at Ilsa and ‘he whispered for her to stop but he too was dead and not worth listening to’. I don’t know what quite to make of that but clearly Liesel was seeing Ilsa with her little girl eyes and not as a spirit with greater understanding as her brother is. What always amazes me is how many characters I care deeply about. For example, there could be a whole book about Ilsa. She is such a moving, interesting, layered character. Even a small character like Frau Holtzapfel breaks your heart and you feel for her and her sons. I think we all like to think we would but hard to say until you’ve been there. I hope so. 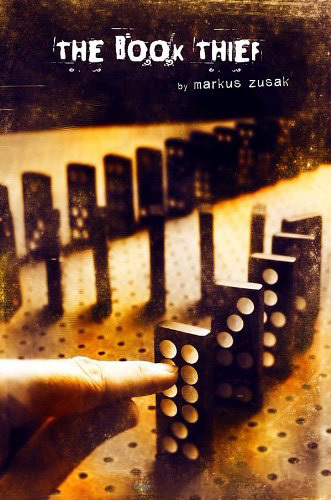 I’ve mentioned several times on this blog how much I love The Book Thief by Markus Zusak. I can confidently say it is the best book published in my lifetime. I can’t think of anything that even comes close. My favorite book is still North and South but this one is a very close second. The other news on the Book Thief front is the trailer for the upcoming movie came out. In some ways I’m optimistic (I really felt it was an unfilmable book) but in other ways very skeptical (how can you not have death in the trailer!). Those who’ve read it what do you think? If you are one of the few people who haven’t read The Book Thief let me tell you why it is so spectacular. It is set in WWII Nazi Germany but it is not a Holocaust book; although that certainly plays into the story. That alone makes it unique. Then it is narrated by death as a sarcastic, scary, biting, politically neutral force. It is a brilliant choice as narrator not simply a gimmick. Who else could be neutral about WWII? Then you have a little girl, Liesel, who’s parents are communists so she and her brother are smuggled onto a train where the brother dies and Liesel stumbles upon her first book. Unable to read she takes it anyway and shows it to her new foster parents The Hubermans. Rosa and Hans Huberman are quite the couple. Hans is all loving and sweetness; while Rosa is somewhat of a tyrant. However, you know that she is helping this girl and a Jewish man named Max who hides in the basement so she can’t be all bad. Later Liesel becomes friends with a little boy named Rudy who adores her and the mayor’s wife Ilsa who has a whole library for her to explore. WWII unfolds for these characters with all kinds of moral challenges, sweet moments and tragedy. You have to read it. The thing that amazes me about The Book Thief is how many well developed characters there are. Most books are lucky if you have two dynamic characters. This book has at least 6 maybe more. There are characters that only appear for a page or two and yet you see a whole story arc and feel for them. It’s amazing. Then the book has so much to say. First, its a commentary on war and the baseness but also grandeur of human nature. Death teaches the reader about all he has learned about mankind at his job, especially in the busy season of WWII. A character like Rudy shows the innocent and loving side. Rosa shows the complex but deeply human side. Hans shows the brave side. Everything around them shows the horrible side. The Book Thief also has something to say about books and the power of words. Liesel is a book thief but in a way aren’t we all. We take the inner most thoughts of the author, absorb it and then make it our own. In the book-within-a-book that Max writes for Liesel, The Word Shaker, we learn about a group of people who have the power to throw words at people. 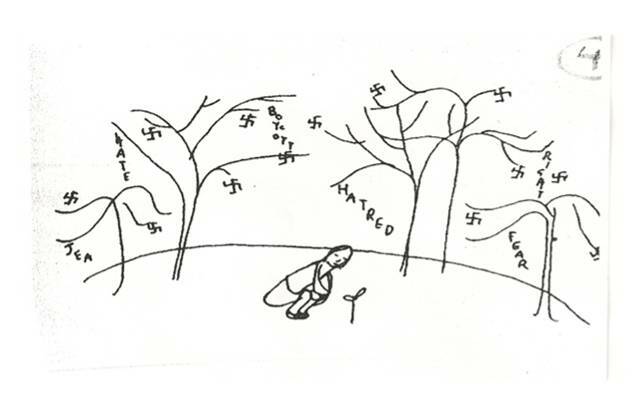 One particular girl climbs a tree and the fuhrer tries to chop it down but despite trying multiple axes he cannot cut the tree or destroy the word shaker. (See why I think this movie is unfilmable). Anyway, Zusak’s point is that words create evil and have the power to save humanity. We should in the end all be book thieves like the word shaker. Maybe such tragedy shown in the book wouldn’t happen if we did. I hope that isn’t any spoilers. I tried. Its such a great book. I’ve read it 4 or 5 times and each time I have a full spectrum of emotions including weeping. Not a small tear but actual flooding. And its a good kind of crying. A crying where you have been truly moved, not manipulated. Second to last time I read it I was listening to it (a great audiobook btw) on a greyhound coming home from a swim in Vegas and at certain point I started to cry. I couldn’t help myself. I wonder what those bus riders thought of me! Anyway, take this chance with Suey’s read along and read The Book Thief. You won’t regret it. I’m reading it again and I look forward to being dazzled all over again. Happy Reading! Please put in the comments what you think of the trailer. Hopeful? Skeptical?